Designed for deep learning research, this WhisperStation features a high-speed Intel Xeon processor, up to 512GB DDR4 memory, four NVIDIA RTX 2080Ti, Titan RTX, or Titan V GPUs, a high-speed NVMe SSD for the operating system, large-capacity storage, and ultra-quiet fans. We provide a turn-key system delivered with Ubuntu Linux, NVIDIA CUDA, NVIDIA cuDNN and your choice of AI containers pre-installed from the NVIDIA GPU Container registry. WhisperStation-Deep Learning has been designed to provide maximum performance when training deep neural networks. It is the perfect system for a researcher exploring the applications of machine learning before such applications move into production. 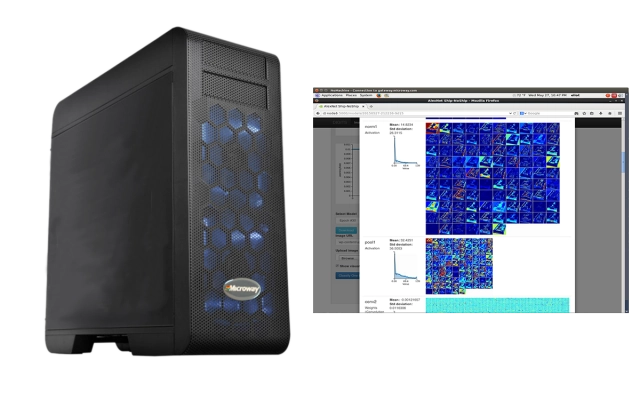 For production-level deep learning, we recommend our professional NumberSmasher server product line with NVIDIA Tesla or Quadro GPUs. Using NVIDIA’s DIGITS interface researchers can collaborate and share GPU resources as they fine-tune their neural networks. With NGC containers, users can realize the latest software optimization and performance-direct from NVIDIA- for their workload. Reliable! Customers commonly use WhisperStations for 5+ years before upgrading.